Early results give the pro-military Palang Pracha Rath Party (PPRP) a larger share of the popular vote. At the same time, the main opposition Pheu Thai party currently has the biggest number of seats in parliament. But there are growing complaints about irregularities during Sunday's poll and a vote count marred by confusion. The Electoral Commission (EC) is also facing strong criticism for its decision to delay publishing the full results without providing any explanation. Thailand's complicated electoral system allocates some parliamentary seats according to the number of votes received. Critics say electoral law changes introduced by the military in 2017 are primarily designed to keep pro-military forces in power. On Monday, the EC announced that Pheu Thai, the party linked to former Prime Minister Thaksin Shinawatra, had won 137 seats in the 500-strong lower chamber of parliament. The PPRP, which supports Thailand's current leader General Prayuth Chan-ocha, was in the second place with 97 seats. Several other parties were getting between 30 and 39 seats each. But the winners of 150 seats were still unclear, the EC said. At the same time, the commission earlier said that with more than 90% of ballots counted, the PPRP had gained 7.6m of the popular vote. That is half a million more than Pheu Thai. Amid confusion over a vote count, the EC was expected to clarify the preliminary results at a news conference on Monday. But the EC instead again delayed announcing the preliminary figures. It also said there would be no official results until 9 May. More than 50 million people were eligible to vote in a much-delayed election, the first since Gen Prayuth Chan-ocha led the coup that ousted Mr Thaksin's sister, Yingluck Shinawatra, five years ago. But the reported turnout was unexpectedly low, at just 64%. Many questioned this figure as well as discrepancies in the vote count numbers. "It's right that we should call it a rigged election," Mr Thaksin told AFP news agency. "Everyone know(s) in Thailand, everyone internationally that observed the election in Thailand, knows that there is irregularity." What's your definition of an election winner? Answers on a polling card, please. Is it the party with the most votes across the whole country or the party with the most seats in parliament? In Thailand, where power can be seized at gunpoint, this is not so much a constitutional technicality but a matter of manoeuvring and momentum. After repeatedly promising - and then delaying - a national vote, the military junta finally granted a ballot only once it had successfully manipulated the electoral system in its favour. Many foresaw a General Prayuth victory as being hollow and illegitimate - achieved through the backing of a handpicked, new senate. But the coup leader can now point to the way the pro-military Palang Pracha Rath Party apparently hoovered up the majority of votes cast as a clear democratic mandate. The opposition Pheu Thai does not see it that way. It feels its own achievement - gaining the biggest share of parliamentary seats - should be rewarded fairly by being allowed to form a coalition of anti-military parties. How does Thailand's electoral system work? The military introduced a new constitution in 2017 which opponents say is designed to keep pro-military forces in power. Thailand's electorate only votes for the 500-seat lower house of parliament. The members of the 250-seat upper house are appointed by the military. 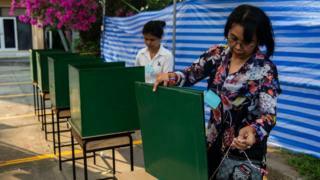 The vote has been seen primarily as a contest between pro-military parties and allies of Mr Thaksin. But the junta has been accused of taking an authoritarian approach to power, strictly controlling the media and arbitrarily using laws like lese majeste - which prohibits any criticism of the monarchy - to silence opponents.